They have been recently shorn, but still, wear moppets of hair on their heads. Some have long bangs in their eyes like punk rockers and others appear to wear curly wool caps. They have regal sounding names like “Colossus, Son of Accoyo Caligula” and “Revolution, Son of Tiago, Grandson of Sinopsis, Danko and Yokon.” There is one albino in the group, a rarity who draws attention by batting pretty blue eyes. And while most casually strut around grazing or curiously looking at visitors to the farm, one little brown alpaca, born only this morning, is racing around amongst them as if he’s in a barrel race with an imaginary friend. It’s obvious that this little guy was probably quite the kicker while in his mother’s womb, just dying to get out and stretch his legs and run, run, run. Why we humans don’t catch on so quickly is beyond me, but Robbin Martinelli has the answer; “In the wild they have to be ready to run to protect themselves from danger,” she said. 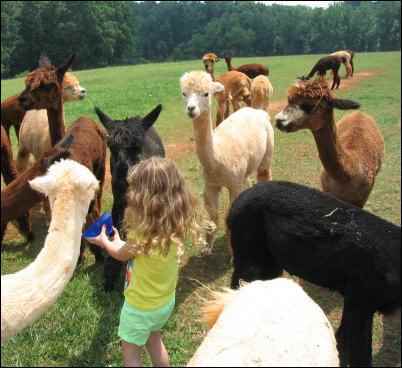 Located in Hardy, Virginia, Smith Mountain Lake Farm Alpacas, owned by Martinelli and husband, Jay Pratley, breeds and sells alpacas, boards them for owners, and sells garments and other collectibles made of alpaca fiber, but another thing they do incredibly well is teach! They teach children and families who tour the farm and they also teach those interested in purchasing and breeding some of their own. The farm provides tours to anyone interested in learning about the creatures, getting a chance to stroke and feed them, and perhaps even hum a tune with them. “Alpacas make a humming sound,” said Martinelli as she spoke to a small group that included several adults and two children, one being my four-year-old niece Learah, who was enthralled. Everyone in the room hummed. She explained how the other alpacas will pop their heads up and look around when they hear that sound. Rarely, a female, if she is an alpha female, will copy the alarm to help in warning the others, but one sound only the male makes is an orgle, which is a braying sound that is his love song to his mate. In fact, the male makes this sound during the entire mating process, otherwise, the female will not conceive. Due to this characteristic, they don’t respond to induced ovulation. Martinelli led everyone from holding their fingers over their heads like alpacas and imitating the orgle sound to learning about the distant relatives of their breeding stock and the alpaca’s origins in the South American countries Peru, Chili, and Bolivia. She explained the various types of alpacas, including the Suri alpaca, which has long hair that twists up and hangs like dreadlocks and the huacaya whose hair grows out like a teddy bear. They all belong to the camelids family (with camels) and alpaca’s use as livestock goes back in time to 6,000 years. They are the oldest living livestock in the world and have just recently been taken off of the endangered species list since people started breeding them and increasing their numbers. She explained the difference between llamas and alpacas, noting that people often buy a llama to help protect the alpaca herd, because llamas will bond with the alpacas and want to protect them, and they tend to be more aggressive than alpacas. 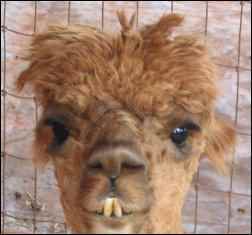 Llamas are larger than alpacas and have been known to kill coyotes (presumably by stomping them to death). Alpacas, on the other hand, are fast runners and this is their way of defending themselves. 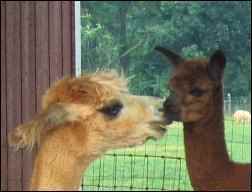 While they don’t do it as often as llamas, Martinelli said alpacas do spit, but that is something they mainly do when fighting one another. The stuff they spit up is bile created in their three-chambered stomachs, and while not dangerous, is quite smelly. Martinelli said alpacas are wonderful animals to raise because they are “Green,” or Environmentally friendly in that they don’t damage the environment. Rather than having hooves, they have two-toed feet with padded toes so they don’t trample the grass, and their teeth include a row of incisors on the bottom only and a plate at the top of the mouth, so they cut the grass like a lawnmower rather than tearing it like some other types of grazing animals do. In addition, since they have pads rather than hooves, they don’t hurt much if they happen to accidentally kick you. In the wild, the pads help the alpacas be more surefooted when climbing on rock. Alpaca farmers also love the fact that these animals all poop in the same place, in one neat pile. Interestingly, the purpose of this for the animals is not so much for the sake of neatness, but as a way to make certain parts of the terrain more visible. Martinelli explained that when alpacas living out in the wild find a good watering hole or some nice fresh pastureland to munch on, they mark that spot for future enjoyment. That way they can look far across the plains and see the manure piles as markers of good grazing areas. Martinelli stressed that Alpaca’s fur is not considered to be wool, but fiber. It is half the weight of wool and twice as strong. It is fire resistant and water repellent, and it’s not itchy like wool. It makes fine luxurious garments that are better than cashmere or angora because it is stronger. The strands of alpaca fur have a hollow core so it has a unique way of insulating for both heat and cold, and the fiber works like a wick by pulling moisture (from sweat) away from the skin, which makes it comfortable in all types of weather. 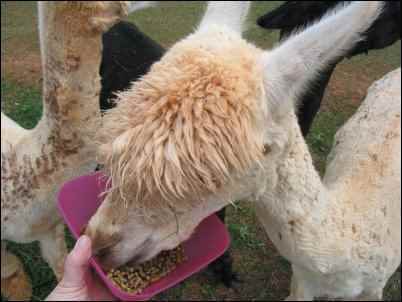 The alpacas all gathered around my niece as she shared her dish of grain and one became fascinated with sniffing her hair. 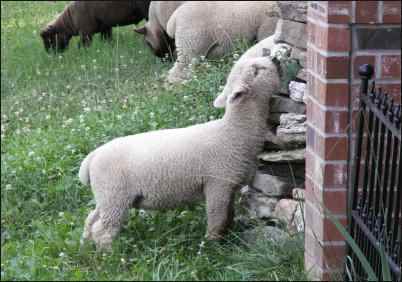 I found myself humming along with the light melodious murmurs of the herd and occasionally stroking one’s chin. While it may seem that the use of alpaca fur in America is something relatively new, an article snippet from the farm’s website notes that back in the 1950s several well-known celebrities began wearing alpaca sweaters on the golf course. Bob Hope and Bing Crosby would wear alpaca sweaters, and Frank Sinatra, along with golfers Jack Nicklaus and Arnold Palmer, created an on-course craze of “alpacas,” baggy-sleeved, loose-fitting cardigans. Sinatra spent about $30,000 yearly on alpaca knitwear at the Palm Springs Canyon Club store. He preferred his alpaca in bright orange. “On our farm, we have some of the most sought after bloodlines in the U.S., all right here in one place,” Martinelli said. 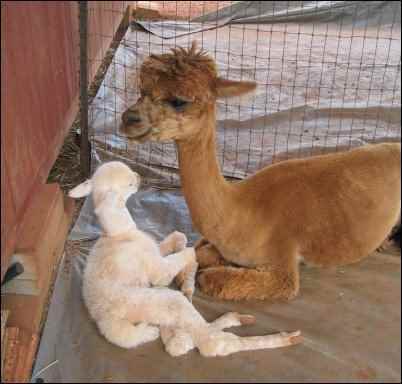 One surprise who was recently born on the farm is Nikon, a white albino alpaca with blue eyes rather than pink. 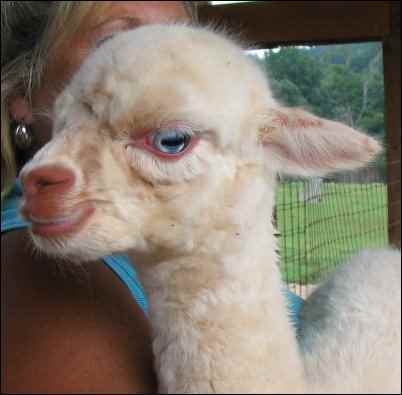 Martinelli said the albino alpaca is very rare and having blue eyes makes it even more uncommon. “I’ve never had one,” she said, noting that the fur is fabulous and will be great to use as fiber, but she won’t breed Nikon, because albinos often carry negative traits such as hearing and sight problems. She has plenty of others for breeding. Considering the high price of these alpacas, Martinelli noted that they are completely insurable for whatever price you pay for them and you can insure your alpaca babies for double the sire fees. She said you can also get a $139,000 tax deduction for your alpaca business, which you can use to buy them. Section 179 of the tax code allows for taxpayers to begin claiming deductions for some capital assets, the things purchased as investments toward profits, as soon as they are purchased. Alpacas are among the limited number of purchased investments that are included in this section. These are benefits that you will not be eligible to receive if you put money toward a traditional investment opportunity, like buying stock or a CD. Martinelli is proud to have alpacas sired by those from a farm in Peru called Accoya, which is owned by the father of alpaca genetics, Don Julio Barreda. The information contained on those ARI pedigree certificates is verified through DNA blood-testing to ensure accuracy. In 1998, U.S. breeders closed the ARI pedigree registry to further imported animals, thus effectively stopping the flow of alpacas into the United States and preserving the value of the animals that are already here. 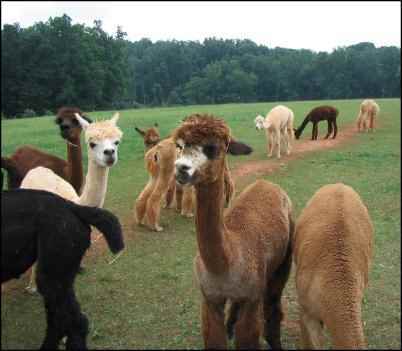 There are only four million alpacas in the world now and 94% of them are still in South America. Today Don Julio Barreda shepherds about 2,500 head at his Accoya ranch in Peru. Approximately 75% are huacaya and the rest suri. The bloodlines of his “Plantel” date to 1946. A plantel male in Peru means a male that has proven his genetics to be highly desirable and has been successful in transmitting these hereditary characteristics to its offspring. Martinelli said she bought her first alpacas and started her farm about 13 years ago, and many of hers carry bloodlines from those originated by Don Julio Barreda. “These are some of the greatest bloodlines in America, and are now found here in the East on our farm,” Martinelli said. Following are the champion bloodlines represented at Smith Mountain Lake Farm Alpacas: Accoyo Caligula’s Full Accoyo Colossus, as well as Hemingway, Legacy, Royal Fawn, White Out, Sinopsis Nocturna, El Padre, Patagonia’s Nishio, Vinicio, Bueno, Rickson, Jockopora, El Trauco, Neruda, Tiago, Kaspa, Pachacuti. Some of these have been named Herd sire of the year – the highest honor given to a breeding male. “Around 2010, my husband Jay and I decided that it would be a good idea to look into using our alpaca fiber from our herd and make pillows. He was calling them “paca pillows” at the time, and our hope is to continue adding products to our line such as mattress pads, and children’s “my paca pillows” as a safe alternative to the toxic merchandise that is being sold today. While doing research in 2012 to get our line off the ground, I spent countless hours and days researching for 100% US made, organic products. What I found was a few small businesses holding on to their values against a multitude of foreign imports. Like them, I refused to give in and use what was simply available for the lowest cost to make my products. Martinelli said she learned about these toxins from talking to her son who is a fireman and because her father died from cancer five years after being in a fire himself. “That fire filled him so full of harmful toxins I barely recognized his bloated body in the hospital,” she said, noting that her father’s fiancé died in that fire, but her father lived five more years before dying of cancer.